Growing up Reuben was taught to read the Book of Tehillim (Psalms) in Hebrew, but he realized there were a lot of components that are obscure and not easily understandable. In his book, he brings out an easily accessible way that any one can understand the Book of Psalms by chronicling the history, the authors, the locations, and even the musical instruments used in Psalms. “Writing the book was a journey,” shares Reuben. In the process, he learned that King David was not the only author for the Book of Psalms, but instead there were ten different authors who were members of the Levitical Orchestra (composers, musicians, or singers). Reuben helps us understand the words that King David and his team put together so we are able to embrace it in a way that is second nature to us when we are communicating or praying to God. “God spoke to man, the Haftorahs (Biblical Prophets). The Book of Psalms is how man would speak to God,” shares Reuben. The greatest way to praise God is through poetry and music. This was the function of the Levital Orchestra. Today not much has changed. We often say a chapter of Psalms during times of trouble or illness. “There are different times and occasions to recite Tehillim (Psalms) as a way to communicate and form a bond with the Creator,” shares Reuben. For example, the Lord is My Shepherd may be recited at a funeral. Utilizing the way King David would think and pray to God is how we should use the same text for specific outcomes. Each sentence holds an eternal message, perfectly phrased to facilitate a dynamic and passionate conversation with God. Reuben hopes to give others something accessible so that we can train our brain to think spiritually for even a few moments a day. 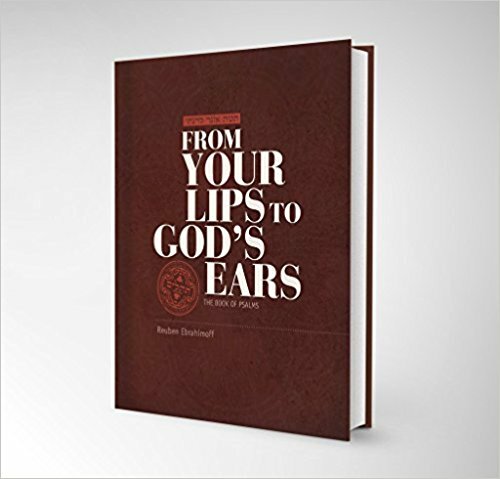 In composing this book, Reuben researched each and every sentence in Psalms. The process from conception to printing took ten years to complete. He hopes his guide to understanding this revered collection of prayers used through the ages in times of joy and sorrow will be a classic in every home, Jewish and non-Jewish alike. Reuben was the first Mashadi Jew from Persia to attend a yeshiva day school in the U.S. He was a student of Brooklyn’s esteemed Rabbi Shimon Kessin who challenged him to seek knowledge of the Biblical Prophets. He embarked on an inspirational journey to seek knowledge of the Biblical Prophets or the Haftorahs. He sought to share his insight and became known as the “Haftorahman.” He has spoken to over 100 congregational audiences across the globe with his interpretations of the Haftorah. His weekly Haftorah facts reach over 2000 people through YouTube videos. For over a decade, he has spent every summer season teaching a Shabbat series on “The World of the Prophets” at the Hampton Synagogue in Westhampton Beach, New York. He is the proud father of a daughter and President of Brilliant I.D.E.A.S., a jewelry manufacturing company in New York. Mashad is a city located in Persia, present day Iran. The Jewish community was established there in the 1740s, where they lived in peace and prosperity. The King of Persia, Nadir Shah, brought 40 Jewish families from around the country to guard his treasury and to collect taxes for him. In 1849 he was overthrown and the Jewish people were then forced to convert to Islam. And for the better part of 100 years they lived as crypto Jews. Reuben’s grandfather The Great Nouruz Kelaty, was one of the men who revived Judaism in the late 1800s. He passed away in the early 1900s and was buried in the city of Mashad for at least 60 years. His bones were brought to the Mount of Olives in Jerusalem where he rests today. “When I went to visit his grave a few years ago I brought a book of Psalms with me. I opened the book randomly and my eyes fell upon a phrase in Hebrew which loosely translates into, from your lips to God’s ears, which is the title of my book,” shares Reuben.